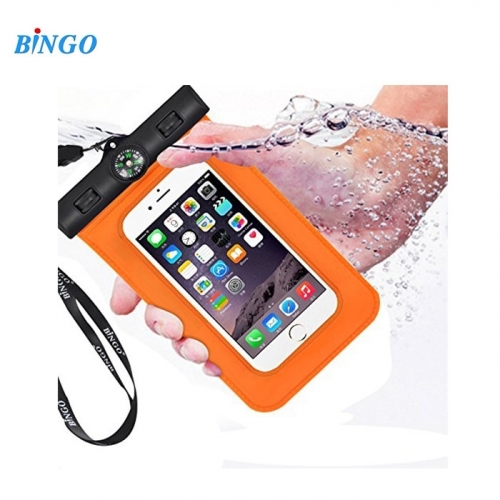 The Bingo waterproof case allow you to take pictures and video under water. dual HD camera shoot free, to capture the wonderful moments under water. This waterproof case is best used no deeper than twenty feet. build-in compass assists you find the right way outdoors. You will get: Bingo waterproof case, Lanyard, arm band and product manual. 1:Our specially designed Crystal Clear windows on both sides are 100% touchscreen compatible and don't produce extra glare. 2:You won't lose your phone or your credit cards and keys no matter how crazy it gets. 3:Easily attaches for safe, easy carrying when swimming. Design allows easy access to all functions without having to remove the case/Floats safely if dropped into water. 4:Just use the included extra pouch to store them, and affix your Safe Ways case to your hand using the included heavy duty lanyard. 5:When you order your SafeWays Beach Bag waterproof phone case today, your purchase is fully protected by our no frills 100% satisfaction warranty. 6:The ultimate super lightweight, ultra durable dry bag.Protect your phone from splashes in this stylish case,You can use the touch screen through the cover. 1)This waterproof case applies to diving, rafting, surfing, skiing, sauna, swimming and other outdoor sports. 2)It is waterproof, dustproof, anti-wind, rain, snow proof, scratch-resistant, the special transparent material allows to answer calls and take photos. 3)The triple waterproof safe system is used for ensuring the waterproof function. 4)Soft jacket does not affect the operation of mobile phone functionality and a variety of protective effects on the cell phone. 1)Before use, please carry out a waterproof test on the product and check whether the product has damaged parts or not, particularly for the seal part and the periphery. 2)It is not recommended to continuously use the product at high temperature, and avoid scratch or drag by sharp articles in the use process. 3)After used in the water, if the phone needs to be taken out, please put the seal downward so as to prevent the residual water from entering the waterproof jacket. 4)After use each time, please check the port and corners and the seal, wipe the water.